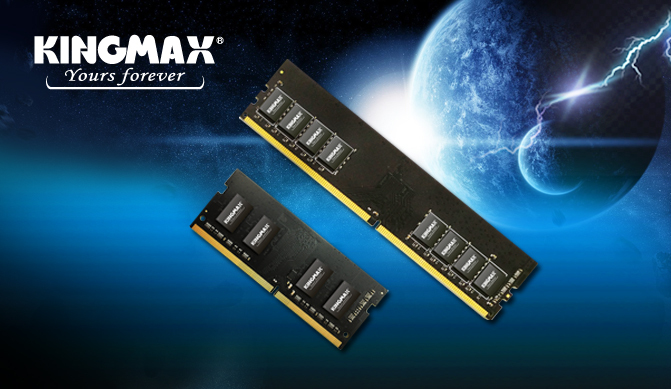 KINGMAX Technology Inc., the world’s leading provider of memory products, today releases its new JEDEC standard DDR4-2666 memory module. The DDR4-2666 RAM is programmed to JEDEC standard latency DDR4-2666 timing of 19-19-19 at 1.2V. The DDR4-2666 RAM is optimized for the latest Intel™ H370, H310, B360 and Z370 chipsets that lets you easily enjoy the ultra-fast speeds without overclocking. KINGMAX DDR4-2666 RAM is especially designed with two RAM types of UDIMM and SODIMM for various system configurations and DIY system builds. At 2666MT/s — the next-generation performance frequency for DDR4 memory — each DIMM provides peak bandwidth of 21.3GB/s. In order to meet different computer upgrade requirements, the DDR4-2666 series is available in multiple capacity packages including single module capacities of 4GB–16GB and kits of 2 with capacities of 8GB–32GB.